Home » Qui sommes-nous? » Blog » What do UK publishers think about mobile ad blockers? 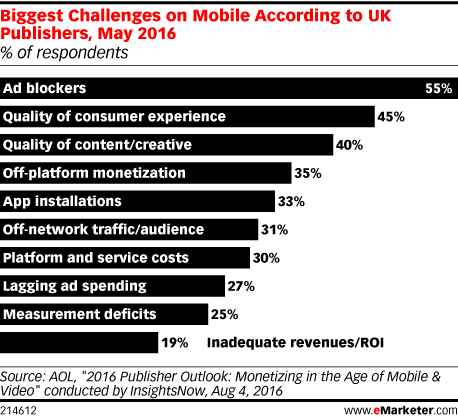 What do UK publishers think about mobile ad blockers? Back in May this year, AOL and research firm InsightsNow surveyed over 300 UK publishers to ask them what were the primary challenges they were seeing on mobile. With over half (55%) putting ad blockers as the biggest challenge, compared to quality of consumer experience (45%) and quality of content/creative (40%). However, mobile does provide publishers with several opportunities. 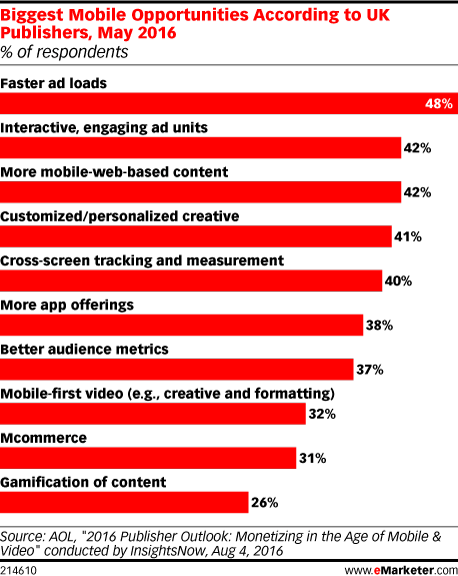 The study also found that faster ad loads and engaging ad units were sited as the top opportunities on mobile, perhaps the respondents felt that these advantages could help aleviate some of the problems of ad blocking. And though respondents said that the quality of the consumer experience and the quality of content on mobile were challenging, many publishers cited personalized creative and more mobile-web-based content as among the biggest mobile opportunities. A quarter of UK publishers said measurement deficits were one of the biggest challenges on mobile, 40% of respondents said cross-screen tracking and measurement was also an opportunity.